Although acupuncture and Chinese herbal medicine can be used independently, they are frequently integrated in practice. ~Upper Grade Medicinal Substances: These are the substances that nourish and prolong life. Similar to “super-foods” of the modern era, upper grade herbs are integrated into daily diet whenever possible to maximize the nourishment obtained from meals. Upper grade herbs can be consumed without concern for creating imbalance in the body, and taken regularly are able to prevent disease. 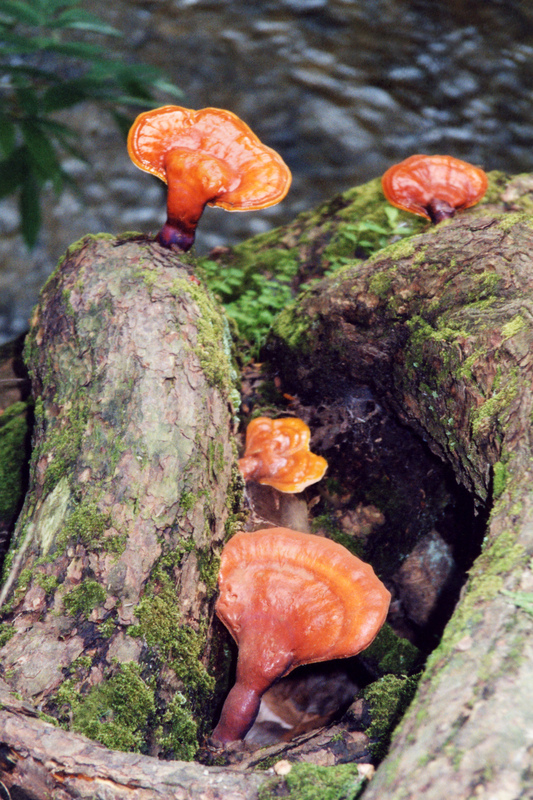 An example of an upper grade medicinal is Ling Zhi, or Reishi Mushroom. ~ Middle Grade Medicinal Substances: These are substances that can be taken to balance constitutional factors affecting an individual’s health, to eliminate suffering, and to prolong life. These substances are taken for a few days or a few months at a time to bring the body back to homeostasis when it has been acted on by outside influences that have disturbed normal functioning. These substances are less gentle than upper grade herbs and may taste particularly spicy, bitter, sour, salty, or sweet. An example of a middle grade herb is Long Yan Rou, or longan fruit. ~Lower Grade Medicinal Substances: These are substances that are used to mitigate serious health problems arising from loss of normal physiological functioning. Used only for acute health problems, these herbs may possess some toxicity or produce side-effects. They are said to “cure illness,” and may be appropriate when the body’s protective mechanisms are compromised. Lower grade substances are only used for short periods of time. An example of a lower grade herb is Gua Di, or Melon Pedicle, which can be used to induce vomiting. The classification of the Chinese Materia Medica strongly reflects the basic philosophy of Chinese Medicine. The concept of upper grade substances suggests that the ultimate goal should be to protect and preserve health. Middle grade substances offer an option to address imbalance with a conservative approach, applying the minimum intervention necessary for the body to correct itself. When the body is no longer able to respond to conservative measures, lower grade substances are used as a last resort. The idea that lower grade herbs are “curative,” just means that the body has lost the normal mechanisms for curing itself. Practically speaking, Chinese herbs may be offered in several different forms. Here are some of the most common ways that Chinese herbs are administered today. 1) Decoction- Raw herbs are placed in water and boiled for 5-120 minutes, depending on the medicinal substance intended for extraction. The resulting “tea” is poured off and consumed over a prescribed amount of time. This is the most potent form of herbal preparation. 2) Pills– Ground raw or prepared herbs are pressed into tablets and taken throughout the day. This form of administration can change the absorption of certain herbs, but is used for those who need a more palatable or convenient option. 3) Granules– Herbal decoction is prepared, sprayed onto a plant starch and freeze dried. These are then dissolved in hot water and taken as a tea, or encapsulated as pills. This is a versatile option with good absorption and potency. 4) Syrups– This is herbal decoction mixed with granulated sugar or honey, and is sometimes used for children or those with chronic cough or sore throat. 5) Tinctures- This is a preparation of herbs in alcohol, taken throughout the day when decoctions are not available. 6) Linaments- These are herbal preparations in alcohol for topical use. Frequently used for traumatic injury, many formulas have been passed down through the martial arts traditions.